, originally uploaded by gregw. Let me tell you, last night I was a crazy book making machine. I have a bunch of totally awesome new books now, I am so excited and I can't wait to share them. It's strange when inspiration strikes, I don't know what causes me to be stuck in a not caring rut all weekend then suddenly be unable to stop creating on a monday night. And now I am super bummed to have to be at work because I want to be at Goodwill scouting out more awesome records and looking for supplies for a new project I came up with last night (which will be a secret for now because I am not sure that it will happen). Such is life I guess. Well, my life anyway. Oh, and about the globe thistle, one of my awesome birthday presents from Steve is a gocco (!) which hasn't arrived yet, but I am trying to be prepared for when it does so I am thinking about what I want to print with this amazing machine. 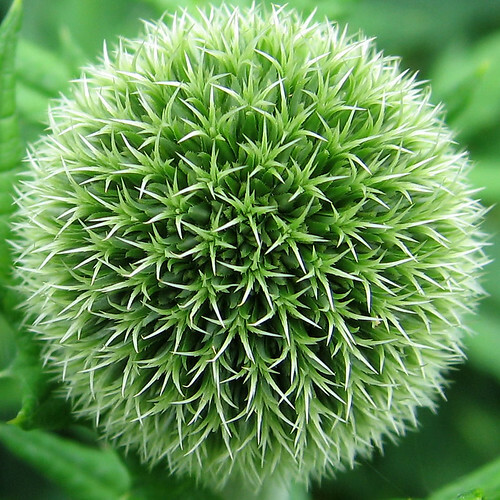 I was reminded of a drawing I did some time ago of a flower I thought was a globe thistle, but google and flickr searches are turning up images which, while very lovely, are not the flower I drew. I'll try to get a scan of the drawing to post, then maybe y'all can help me identify it. Thanks! That's so awesome that you're getting a Gocco!! They're SO MUCH fun! One of the things I found hard with mine was getting images that were the right type to print and then imprint into the screens. They usually were pixelated or too small or something. Then I found out that you can actually buy books of Ebay (or in bookstores I'm sure) that have a CD of pictures that work perfectly for Gocco. They're not copywrited either, which helps. I'll try to find the name of the books and give it to you...I ordered a couple and the images work perfectly! Hello, my name is mel, welcome to my blog. This is where I will talk about awesome artists I have come upon as well as things I'm making and things you can buy from Roska Handmade! Thanks for stopping by!